We are busy gearing up for another summer full of fun and learning at DC Public Library. Discover great books. Attend fun events like story times, music and dance performances, STEM and maker workshops, author talks and more. Kids, teens, adults and even babies can get in on the fun. Everyone who participates will win prizes just for reading. Stayed tuned for more details coming soon. Summer Challenge may be over but there’s no reason to stop reading. If you and your family have adopted the habit of reading for at least 20 minutes a day be sure to keep it going. Continue to use Beanstack to track how much you are reading and see how well you are doing meeting your 20 minute goal. Don’t forget that in addition to books, reading material like magazines, websites, email and Facebook also count as reading. 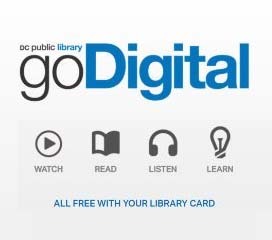 Did you know that the DC Public Library has the latest e-books, music and movies all available for free? Using the library’s digital resources is a great way to meet you goal of reading for 20 minutes. Whether you’re looking up information on one of our databases, learning a new language, or streaming your favorite album, anything you do on our GoDigital platform counts towards your 20 minutes. The DC Public Library thanks the following partners for their support.